Vaptio Capt'n TC Kit with Paragon Tank is powered by dual 18650 batteries to fire up 220W to deliver huge cloud. Its 1.3-inch TFT color screen will tell you status of vape clearly. 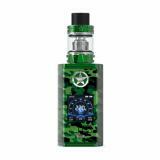 Vaptio Capt'n TC Kit with Paragon Tank, which adopts 1.3-inch TFT color screen to show status of vape clearly, can run up within 0.005 seconds to save your time. In addition, it contains different output modes that include VW, TC, Smart, CCW, CCT,Bypass to deliver different flavor.Powered by dual 18650 batteries, it can fire up to 220W. The tank has optional 2ml and 8ml liquid capacity for choice. Zinc-alloy frame and IML panel body to ensure high quality. Just get it to enjoy vaping. • Three-month warranty for CAPT’N Mod and Paragon Tank. • No battery or luquid are included. I would had given 5 stars but the coil that came with the tank didnt work, so i had to go buy them, not something i wanted to do, living in a small town, but besides that it works great and got to me pretty fast.